Are you facing a problem with the Safari, Google Chrome and Firefox browsers that constantly displays lots of unwanted ads? Then, there are chances that are your Apple Mac is infected by the SearchPageInjector adware (sometimes named ‘ad-supported’ software). Most often, the SearchPageInjector adware installs on the Apple Mac in a bundle with freeware that you downloaded and installed from the World Wide Web. Once it gets inside your machine, it’ll change certain MAC system’s settings including newtab page, home page and default search engine in order to redirect your’s web browser to unwanted web-sites or display unwanted ads from various third-party ad networks. The SearchPageInjector may add lots of advertisements directly to the web-sites that you visit, creating a sense that the sponsored links have been added by the makers of the page. Moreover, legal advertising links may be replaced on the fake ads, that will offer to download and install various unnecessary and malicious programs. Even worse, some adware like the SearchPageInjector has spyware and keyloggers built into the application, leading to greater damage to your MAC OS and possible invasion of your personal information. We strongly suggest that you perform the steps below which will allow you to remove SearchPageInjector using the standard features of Mac OS and some proven free programs. In the few simple steps below we will have a look at the adware and how to remove SearchPageInjector ads from Safari, Mozilla Firefox and Chrome web-browsers for Mac, natively or by using a few free removal utilities. Certain of the steps below will require you to exit this site. So, please read the few simple steps carefully, after that bookmark or print it for later reference. Read this “How to remove” section to know how to manually delete SearchPageInjector adware which cause undesired popup ads to appear. Even if the few simple steps does not work for you, there are several free malware removers below that can easily handle such SearchPageInjector that causes internet browsers to display intrusive popup ads. Some of potentially unwanted applications, adware and browser hijackers can be removed using the ‘Move to Trash’ tool that is located in the Finder. So, if you’re using any version of Apple Mac and you have noticed an unwanted application, then first try to remove it through the Finder. Open Finder and click “Applications” as shown below. 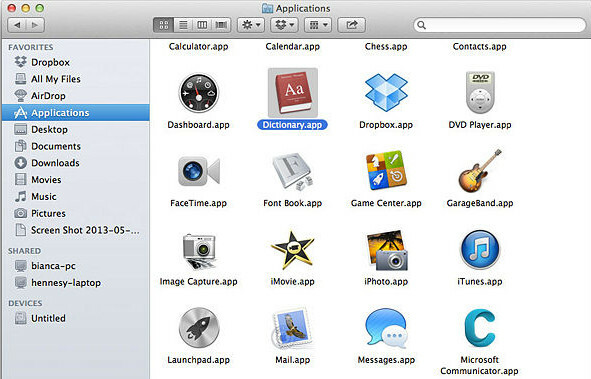 You will see a list of apps installed on your MAC. We recommend to pay maximum attention to the program you installed last. Most probably, it is the SearchPageInjector ad supported software which causes unwanted pop-up ads. If you are in doubt, you can always check the application by doing a search for her name in Google, Yahoo or Bing. After the application which you need to uninstall is found, simply right click on its name, and select “Move to Trash”. If you find that Safari internet browser settings such as homepage, new tab page and search engine having been replaced by SearchPageInjector adware, then you may return your settings, via the reset internet browser procedure. First, click the “Security” tab. Here, select “Block pop-up windows”. It will block some types of popups. Now, click the “Extensions” tab. Look for dubious plugins on left panel, select it, then click the “Uninstall” button. Most important to remove all suspicious add-ons from Safari. Once complete, check your startpage and search engine settings. Click “General” tab. Make sure that the “Homepage” field contains the website you want or is empty. Make sure that the “Search engine” setting shows your preferred search provider. 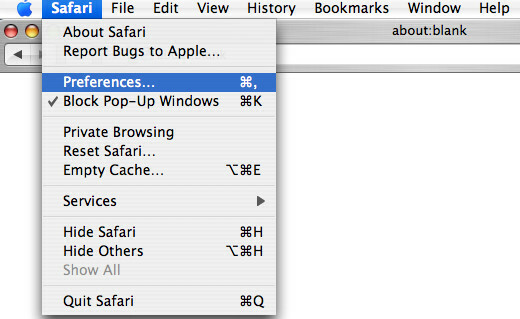 In some versions of Safari, this setting is in the “Search” tab. This step will help you remove SearchPageInjector adware, third-party toolbars, disable malicious extensions and return your default home page, new tab page and search engine settings. Click the Menu button (looks like three horizontal lines), and click the blue Help icon located at the bottom of the drop down menu as displayed below. 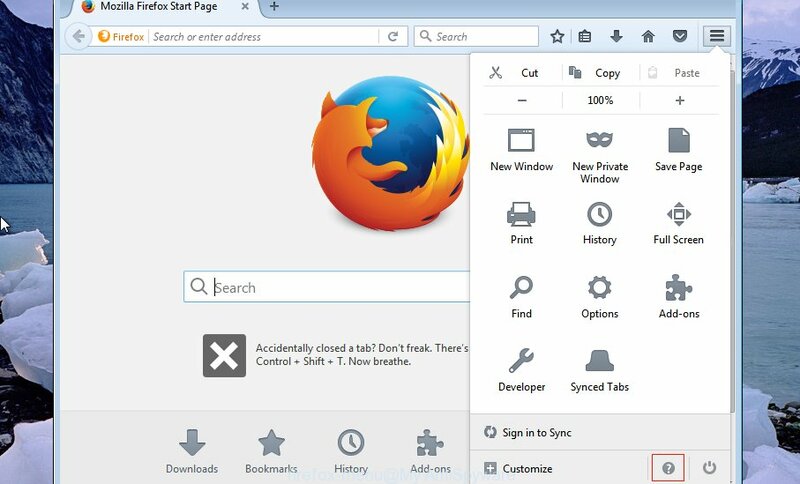 Follow the onscreen procedure to restore your Mozilla Firefox internet browser settings to their default state. Use the Reset internet browser tool of the Google Chrome to reset all its settings like start page, default search engine and new tab page to original defaults. This is a very useful tool to use, in the case of browser redirects to annoying ad web-pages such as SearchPageInjector. You’ll see the list of installed extensions. If the list has the plugin labeled with “Installed by enterprise policy” or “Installed by your administrator”, then complete the following instructions: Remove Chrome extensions installed by enterprise policy. Once this task is done, your internet browser’s startpage, new tab and search provider by default will be restored to their original defaults. 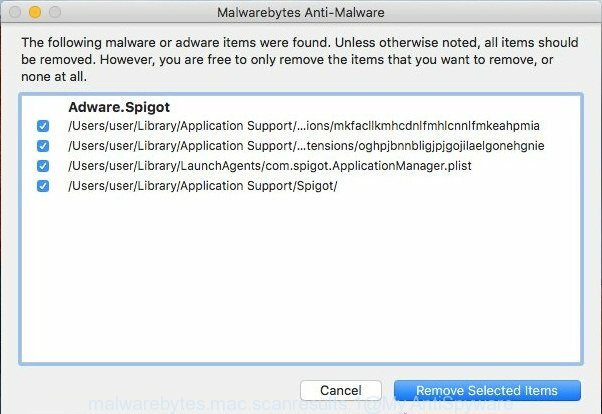 If your MAC system is still infected with SearchPageInjector ad-supported software that causes internet browsers to display annoying pop-up ads, then the best way of detection and removal is to use an anti malware scan on the computer. Download free malicious software removal utilities below and start a full system scan. It will allow you get rid of all components of the adware from hardisk and Windows registry. We recommend using the MalwareBytes AntiMalware (MBAM) which are completely clean your computer of the adware. This free utility is an advanced malware removal program made by (c) Malwarebytes lab. This program uses the world’s most popular antimalware technology. It is able to help you remove annoying SearchPageInjector adware from your web-browsers, potentially unwanted programs, malware, hijacker, toolbars, ransomware and other security threats from your Apple Mac for free. Visit the following page to download MalwareBytes AntiMalware (MBAM). After downloading is finished, close all programs and windows on your computer. Open a file location. Run the downloaded file and follow the prompts. Click the “Scan” button . MalwareBytes AntiMalware (MBAM) tool will begin scanning the whole Apple Mac to find out SearchPageInjector which created to reroute your web-browser to various ad sites. While the MalwareBytes Anti Malware (MBAM) program is scanning, you can see how many objects it has identified as threat. Once MalwareBytes has finished scanning your MAC system, MalwareBytes will prepare a list of undesired programs adware. Make sure all threats have ‘checkmark’ and press “Remove Selected Items”. If you surf the Internet, you can’t avoid malvertising. But you can protect your internet browser against it. Download and use an ad-blocking program. 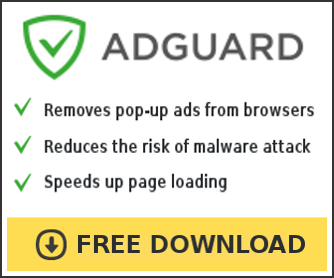 AdGuard is an ad-blocker which can filter out a large count of of the malicious advertising, stoping dynamic scripts from loading harmful content. AdGuard can be downloaded from the following link. When the downloading process is finished, run the downloaded file. You will see the “Setup Wizard” screen. Follow the prompts. Each time, when you launch your Apple Mac, AdGuard will start automatically and stop unwanted ads, block malicious or misleading web-sites. Now your MAC should be free of the SearchPageInjector that causes multiple undesired advertisements and popups. We suggest that you keep MalwareBytes Free (to periodically scan your MAC OS for new adwares and other malicious software) and AdGuard (to help you block intrusive advertisements and malicious web pages). Moreover, to prevent any ad supported software, please stay clear of unknown and third party programs. If you need more help with SearchPageInjector ad-supported software related issues, go to here.